Madonna's Rebel Heart Tour in Manila is WORTH IT! Don't let anyone tell you otherwise. - All Chucked Up! You are Here >> Home >> Music >> Madonna’s Rebel Heart Tour in Manila is WORTH IT! Don’t let anyone tell you otherwise. 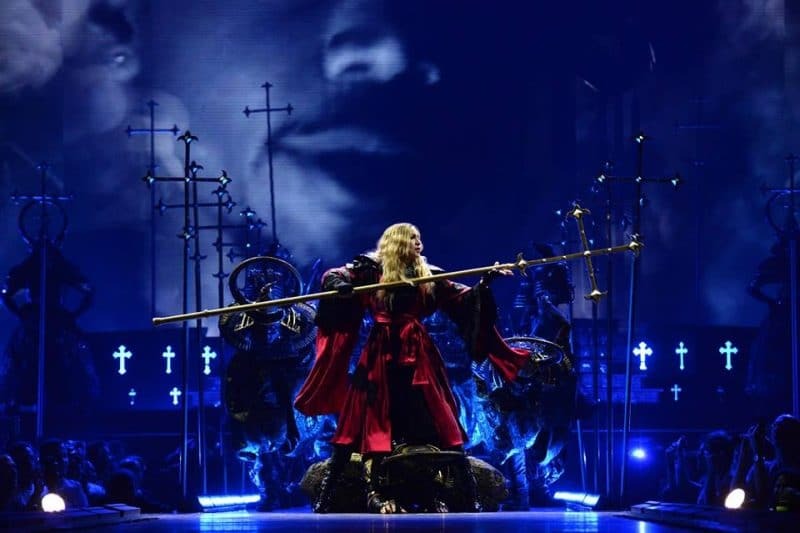 Madonna’s Rebel Heart Tour in Manila is WORTH IT! Don’t let anyone tell you otherwise. I noticed that there has been so much talk as of late about Madonna’s Rebel Heart Tour in Manila. Unfortunately, some of these conversations have been about the event’s ticket prices which some consider to be quite expensive. A lot of bloggers, as if in perfect sync and seeming orchestration, have suddenly published posts that suspiciously have the same tone and the same question. These individuals have been asking, “What’s so wonderful about spending Php 60,000.00 for a concert?”, followed by a call for people to join a particular promo instead, with the possibility to watch Madonna for free. The ploy it seems is to convince readers to believe that theirs is “the better choice”. But, my question is… is it REALLY the better choice? Let’s break it down for a second and see if what they say truly holds water. First and foremost, the price of the ticket IS NOT Php 60,000.00, ok? Rounding off the figure distorts the argument. The exact figure of the SVIP tickets for Madonna’s Rebel Heart Tour in Manila is Php 57,750.00 only. That’s a difference of Php 2,250.00. C’mon, guys! Secondly, no one is forcing anyone to buy anything. These bloggers need to stop overreacting. If you cannot afford to get the SVIP tickets or even the Php 3,150.00 Gen Ad seats, then don’t. There’s no need to even explain why you aren’t going. What’s the point? Yes, Madonna’s Rebel Heart Tour in Manila has SVIP seats priced at Php 57,750.00… General Admission tickets cost Php 3,150.00. However, an Upper Box seat already offers a really great view of the concert and will only set you back Php 8,400.00. This is the reason why I find it absurd that these bloggers keep on complaining about that Php 57,750.00 price tag. Get over it. There are other sections to choose from which will better fit your ideal budget. Another thing… have you ever seen a Madonna concert on DVD? If you have, then you’d agree with me when I say that even on video, her spectacularly grand production numbers are absolutely breathtaking even when viewed on a small television screen. What more when you’re actually there watching it LIVE and in person. Don’t tell me that the production value of Madonna’s performances aren’t worth it because they most definitely are. The heavily announced promo these bloggers have been preaching online isn’t exactly free, folks. The said promo encourages you to spend money to gain points which raises your chances of watching Madonna abroad. And even if you did win the promo, you’ll still need to have a valid passport and US VISA to actually be able to fly to the concert. No VISA? Tough luck! You’re gonna have to cough up Php 7,000.00+ just to book an appointment with the US Embassy for interview – with NO ASSURANCE that you’ll be getting a VISA, by the way. Then there’s the Php 3,000.00+ travel tax that you’re gonna have to worry about which isn’t covered by the promo. With that amount of money, you could already afford a great UPPER BOX seat for Madonna’s Rebel Heart Tour in Manila without the hassle of going to the embassy. Now, there’s a thought! Which would you rather have? The chance to win a trip or a guaranteed opportunity to see Madonna perform for the first time in the Philippines? That’s pretty much a no brainer. I don’t think anyone in their right mind would consider banking on their slim chances a practical and better choice. And oh…! If you were actually considering on joining the promo, here’s something you probably didn’t realize – the said promo didn’t even specify what kind of concert seat the winner would be getting. What if you flew all the way to the concert only to end up in the General Admission section as well. LOL! What a bummer! 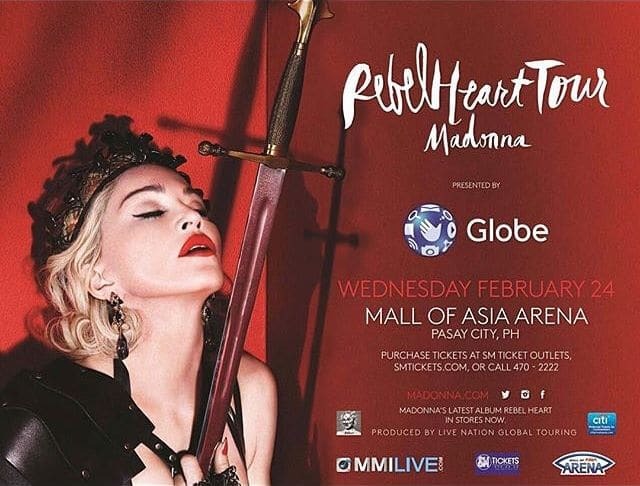 Seriously, guys… Madonna’s Rebel Heart Tour in Manila marks her first ever concert here in the Philippines. This is something all Madonna fans in this country have long been waiting for. If you truly are a fan of the Queen of Pop, it doesn’t get any better than this. And you know it. In closing, here’s what I have to say to all the haters of Madonna’s Rebel Heart Tour in Manila… The 2nd day of the concert is about to be SOLD OUT already. GOOD LUCK with your raffle! LOL! Good point. I agree with you. Nice to stumble upon this site of yours!